This month's goal has to be simple. I have too many other non-quilting/sewing related commitments cluttering up my time to distract me from starting a new quilt or trying to quilt one in the stack of tops waiting patiently for rainy weather. October 1st is the day I have to mail out mug mats to my partners in the TreadleOn Yahoo list exchange. My goal is to finish up and get the packages in the mail. All sewing has to be done on a treadle or hand-crank sewing machine. I have chosen Minnie, the Singer 99 hand-crank, to do the honors. 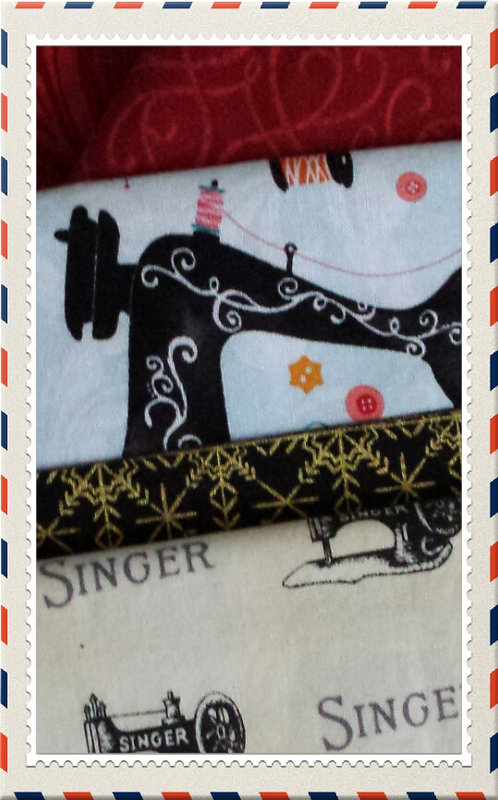 Only a sneak peek of the fabric is allowed until I reveal them at the end of the month. And Cheryl of Cheryl's Teapots 2Quilting, if you are reading, yours are completely different. 😉 Cheryl was my exchange partner for a mug mat exchange on the QuiltAlong Yahoo list. Those were due in the mail yesterday. Of course I'm reading ;) Looking forward to mine. My TO partner and I exchanged early (we were both done already), and I'll have pictures soon. Exchanges are sew much fun! Sounds like a fun swap. Thanks for linking up with Elm Street Quilts One Monthly Goal and good luck on your project. Very cute fabric you're showing off. I am currently looking for some sewing related fabric. Is it current or has it been out forever? I know you'll meet this goal!